The recent tragic derailment on the Northeast Corridor has raised some interest in railroad signaling systems, so here’s a short introduction to North American practices. If there are any actual signal engineers out there, feel free to correct anything wrong with the logic; however, we are going to simplify the technical side of things to make it easier to read. The need for signaling arose from a simple fact: the stopping distance for a train is very large. If you want to get a productive amount of capacity out of your tracks, you can’t depend on a fixed timetable and operation of trains by the driver’s line of sight. 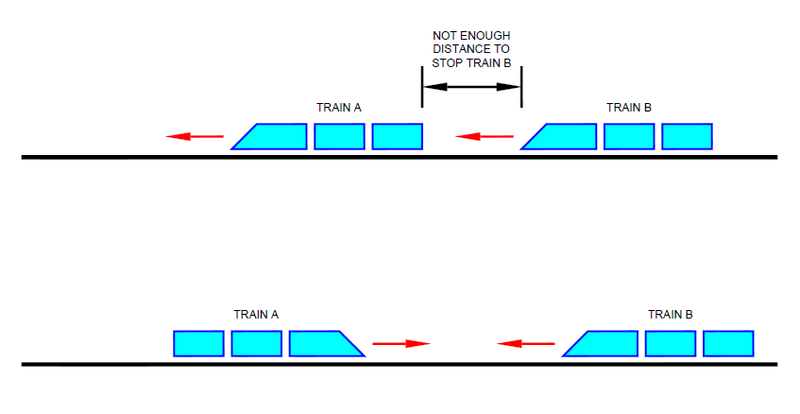 Thus, to prevent trains from crashing into each other, you need a way to (a) maintain enough space between trains moving in the same direction on the same track to allow a train to stop safely if something like a derailment happens to the train in front of it, and (b) prevent authorization of conflicting movements, e.g. two trains colliding head-on on a single track or two movements through a set of switches that pass through the same track. Groups of switches controlled by the same signal location are known as interlockings. Note that enforcement of civil restrictions – that is, speed restrictions resulting from civil engineering features like curves in the track, low-speed bridges, and grade crossings – was not one of the founding motivations for signaling. We’ll return to that later. Signal engineers solved this challenge by dividing the tracks into sections called fixed blocks. Only one train is allowed in a block of track at a time. When a block is occupied by a train, the signal next to the track at the entrance to the block (a “wayside signal”) will be set to red, or “Stop”. Under the most basic systems, each block of track will be long enough to stop a train from the maximum authorized speed (MAS) allowed on that section of track. The next signal behind the occupied block will be set to yellow, or “Approach”, meaning the train must approach the next signal prepared to stop. Finally, the next signal after that will be set to green, or “Clear”, meaning the train may continue at the MAS. The signal system is also designed so that all of the signals in the opposite direction will be red. The indication displayed by a signal is known as the “aspect”. For the sake of simplicity, we’ll ignore the myriad different types of wayside signals that developed; the principles and information conveyed by the signals are the same. Again, note that these signals do not convey information about civil speed restrictions. The MAS depends on civil speeds and may vary quite a bit in curvy areas, but it is not practical to vary the signal design speed (SDS) of the signal system as frequently. Therefore the SDS was often set to be equal to or slightly greater than the largest MAS in the territory. Selecting a higher SDS increases the design stopping distance, providing an additional margin of safety, but reducing capacity. Capacity can be improved by making the signal blocks shorter. For example, by cutting each block in the previous arrangement in half, we can cut the wasted stopping distance in half. Under this arrangement, a train now needs two blocks to stop, so the clear signal must be three blocks back from the occupied block. We also need to add another signal aspect between yellow (Approach) and green (Clear), to tell the train that it needs to stop two signals ahead. This aspect is often called something like “Advanced Approach” or “Approach Medium”, where the latter means approach the next signal at medium speed, usually 30 mph. This setup is known as a “three-block, four-aspect” signal system. Rather than adding a fourth color, railroads using color light signals added a second lamp, using combinations of colors to indicate different aspects. Here, for simplicity, we are using green/green for Clear, yellow/green for Approach Medium, yellow/red for Approach, and red/red for Stop. You could envision chopping the track up into ever-smaller blocks and adding more signal aspects to reduce the wasted capacity. However, that quickly gets expensive, as you have to keep adding more and more signal locations, and there are diminishing returns in terms of capacity for each additional location. Most freight lines are essentially still two-block, three-aspect systems, and most commuter lines are three-block, four-aspect systems at best. Running high-speed trains on the Northeast Corridor required some additional changes, as we’ll see later. We’ll also get to systems that don’t require fixed blocks later as well. Displaying the right signal requires you to know what’s going on, in real time, at other locations on the railroad that might be miles away. This was not an easy thing to do in the 1800s. It was solved by an ingenious invention – the track circuit. At one end of the block, the rails are connected to a battery, one rail to the positive terminal and the other to the negative terminal. At the other end, the rails are connected to an electromechanical device called a “relay”. If electricity is flowing from the battery through the rails to the relay, the relay becomes an electromagnet, and the magnet picks up a metal bar connected to a hinge called an armature. If a train enters the section of track, the train’s axle will short out this circuit. The relay will stop being a magnet, and the metal bar in the relay will drop. This setup has a side benefit in that the relay will also drop if a rail breaks or the track washes away. So, as long as the relay is up, you know the track is there and that there’s no train in that block, so it’s safe to allow a train to enter. Running line wires all over the place along the tracks is costly and they get destroyed by weather over time, so signal engineers eventually devised ways to communicate between locations without using line wires. The most common way this is done today is through the use of electronic track circuits. With electronic track circuits, the line wires are replaced by the rails themselves. A signal location transmits coded pulses of electricity over the rails to an adjacent signal location, where a computer processor interprets the message, determines what signal aspect to display, and decides what message to send to the next location. For computer-savvy folks out there, these are not messages with many bits of data; they are just a small number of predetermined patterns of electrical pulses. Some railroads have gone with systems capable of more sophisticated communications, such as fiber-optic networks. The fatal flaw in these signal systems is that they still depend on the driver to obey the signals. If the driver falls asleep or decides to send a text to someone or is otherwise incapacitated, nothing will stop the train from running a red signal and crashing into another train. The Pennsylvania Railroad started addressing this problem nearly a century ago with the introduction of cab signals with automatic enforcement. These systems display speed information to the driver in the cab and will take automatic action to stop the train if the driver fails to obey the indicated speed. Information is transmitted between the wayside signal equipment and the train using pulses of electricity in the rails. Equipment on the locomotive detects these pulses and converts it into a speed indication on a screen in the cab. These pulses are even more basic than electronic track circuit communications, and are based simply on a number of pulses per minute. The most common system corresponds to a three-block, four-aspect system deployed all over US commuter railroads, with available pulse rates of 0, 75, 120, and 180 pulses per minute. These correspond to speeds of 0 mph, 30 mph, 45 mph, and MAS, respectively, or to signal aspects of Stop, Approach, Approach Medium, and Clear, respectively. Note that to enforce a stop before a red signal, the 0 mph indication must be given in advance of the signal, in the block where our wayside signal was showing yellow/yellow or Approach. To avoid slowing trains down too much, systems were devised to allow a mid-block change from a 30 mph code to a 0 mph code in the block leading up to the red signal. With few exceptions, such as Metro North, railroads did not take the opportunity to eliminate wayside signals, which had been made redundant, especially between interlockings. This was deemed to be safer and more reliable, because if the cab signals failed, trains could still operate following the wayside signals. However, it increased the amount of equipment that needs to be built and maintained. Transit systems use similar cab signals, but with different speeds available. For example, PATCO uses 0 mph, 20 mph, 30 mph, 40 mph, and 65 mph, while LACMTA’s light rail uses 0 mph, 15 mph, 25 mph, 35 mph, 45 mph, and 55 mph, plus a yard mode (10 mph) and a street-running mode (35 mph) for places like Highland Park or Washington Boulevard where signals are not enforcing separation of trains. With the desire to introduce higher speed trains (Acela) to the Northeast Corridor, it was decided to increase the number of available cab signal indications. This was done to prevent higher speeds from reducing capacity, since higher speeds require longer stopping distances, and provide an 80 mph cab indication that could be used to enforce the safe speed through high-speed switches at interlockings. Since the Northeast Corridor is electrified with alternating current at 25 Hz and 60 Hz, and the return current flows through the rails, care must be taken to ensure there is no interference between the traction power system and the signals. Therefore, the cab pulses are modulated with 100 Hz AC, i.e. a 75 pulse code is 75 pulses of 100 Hz AC energy per minute. The 80 mph, 100 mph, and 150 mph cab codes were created by introducing 250 Hz AC energy to the rails during the off phase of the 100 Hz pulses. Thus, the 80 mph indication consists of 120 pulses of 100 Hz and 120 pulses of 250 Hz per minute. 100 mph is 270 and 270, and 150 mph is 180 and 180. Commuter rail equipment that was not upgraded to read both 100 Hz and 250 Hz would see only the 100 Hz energy, and interpret the code as such. The arrangement for the 80 mph, 100 mph, and 150 mph indications let the commuter rail operators off the hook for upgrading their on-board equipment. Old equipment would simply read these indications as 45 mph, 60 mph, and 125 mph, respectively, and since they were not going over 125 mph there was no need to read 150 mph. In addition, the 60 mph and 100 mph codes were not deployed until very recently, since older equipment could not read those indications. Everything we have discussed so far concerns maintaining safe separation of trains and preventing conflicting train movements from happening at the same time. Traditionally, these systems were not used to enforce civil speed restrictions resulting from curves in the track, slow bridges, and other civil engineering features on freight lines and commuter lines. This function was not seen as the responsibility of the signal system. In addition, many commuter and freight lines have long signal blocks, so restricting the entire block to the speed dictated by short speed restrictions has an impact on capacity and travel times. For example, a 45 mph curve might only be 1,000’ long, but straddle two signal blocks, and therefore might put a 45 mph restriction on two miles of track if the signal system was used to enforce the speed. Now, even before the advent of computer controlled signal systems, there were workarounds to this issue. You could use a timer relay – a relay designed to drop a specified amount of time after the energy is removed – to change the cab code a certain amount of time after the train enters a block, designed by some smart engineer to minimize the travel time and capacity hit. You could use capacitors to hold up a relay, again for a pre-determined amount of time, which I’ve heard is actually how Metro North used to time out 30 mph cab codes to 0 mph. In practice, I don’t think this was done, both because of the costs and because it wasn’t seen as the responsibility of the signal system. With the software logic making the decisions nowadays, plus the ease of calculating stopping distances and distances needed to slow down to a target speed, it’s not difficult to use timed cab code changes. In fact, my understanding is that Metro North’s new signal designs will use timed cab code changes for every code in every block, to maximize capacity of a fixed block system. Note that many transit systems do use cab signals to enforce civil speeds, since they have shorter signal blocks and more consistent types of traffic. Using timers, as described above, to change cab signals in block makes it easy to reduce the impact of signaling the speed restriction. In the case of the Northeast Corridor, the inability of older equipment to read all of the cab signal indications would make things worse; for example, if you restricted an 80 mph curve using the 80 mph cab indication, older equipment would read it as 45 mph and be slowed down for no reason. Rather than use the cab signal system, it was decided that civil speed restrictions would be enforced for high-speed trains on the Northeast Corridor using a wireless overlay signal system – the Advanced Civil Speed Enforcement System (ACSES). Permanent speed restrictions are loaded into an on-board computer database and enforced by the on-board equipment as the train moves along the track. The on-board system tracks the train’s location by counting wheel rotations, and correcting at fixed locations known as balises. A balise is like a giant transit fare card mounted between the rails, transmitting information to the train when the train passes over it the same your TAP card transmits information to the fare machine when you tap. ACSES also allows enforcement of temporary speed restrictions, such as those imposed during construction, and prevents trains from accidentally entering work zones. These functions are accomplished with wireless communications between the train and wayside equipment. This system was only installed where higher speeds would be achieved: from New Haven, CT to Boston, MA, New Brunswick, NJ to Trenton, NJ, and Wilmington, DE to Perryville, MD. This was likely done to save money. Since ACSES is an overlay system, there was no need to upgrade commuter rail equipment to be compatible with it, again letting the commuter railroads off the hook for capital improvements. Also note that it again increased the amount of signal equipment that must be installed, increasing capital and maintenance costs. This contrasts with the European equivalent of ACSES, the European Train Control System (ETCS), which is intended to replace the legacy wayside signal systems in use across the continent. ETCS also uses on-board equipment, fixed balises, and wireless communication to monitor and control train movements. On the other hand, when the positive train control (PTC) mandate came from Congress in 2008, the vast majority of freight lines did not even have cab signals installed. Their track blocks tend to be miles long, and freight operations depend much more heavily on the driver’s judgement, because there’s huge variability in the type of traffic. A fully loaded coal train has much different braking performance than a rack of empty intermodal cars, and improper application of brakes on a long freight train runs the risk of derailments and separations. Thus, cab signals and ACSES are both expensive and a poor technological fit for the freights. The major freight lines, and thus everyone else outside the northeast by proxy, settled on a system they call Interoperable Electronic Train Management System (I-ETMS). This was deemed necessary to allow interoperability, as required by the Federal Railroad Administration (FRA), and to facilitate trying to meet the PTC deadline of December 31, 2015. I-ETMS is a wireless radio-based system that will be overlaid on top of the existing wayside signal systems. On-board equipment will include a database of track geometry and speed restrictions, and monitor the location of trains. The wayside equipment will communicate with the train to indicate upcoming signal aspects and the target stop location, if there is one. The on-board equipment must account for the type of train to determine the proper braking. Communications-based train control (CBTC) uses wireless communication between on-board equipment and wayside equipment to execute all signal functions. In a full CBTC setup, there’s no need for fixed signal blocks, and the wasted capacity is small. The position of all trains and the status of tracks and switches are monitored in real time. The system doesn’t need to start braking a train until the distance to the train in front drops to the safe stopping distance – it’s as if the red signal is always just behind the rear of the train ahead. This is also called a moving block system. While both ACSES and I-ETMS use wireless communications, they’re not really true CBTC systems, since they’re just overlays on top of fixed block signals. There are very few CBTC systems in operation in North America but there are some, such as the L Line on the New York City subway. CBTC is most beneficial in places where capacity is very tight, such as heavily traveled subways. The European Train Control System (ETCS) presents an elegant, truly wireless signal system that is not an overlay on top of existing wayside signals. The full implementation, called Level 3, does not use expensive wayside signals, axle counters, or track circuits at all, instead relying solely on balises, on-board equipment, and radio communication. The step below full implementation, called Level 2, still relies on wayside equipment like axle counters or track circuits to determine if fixed blocks are clear. The step below that, Level 1, is an overlay system that can be considered similar in spirit to the other overlay systems discussed here. My understanding is that at the time the PTC mandate was enacted by Congress, in late 2008, the ETCS standards were still in development and the system had very limited deployment. Given the limited timeframe for installing PTC, it seems reasonable that no one wanted to take a chance on ETCS Level 2. The FRA’s guidance made it clear that it would accept cab signals plus ACSES as a PTC-complaint system; since ACSES was already in use, this strongly influenced the decision of northeastern railroads to choose that solution. Meanwhile, the freight railroads decided to develop I-ETMS based on technology they had already been experimenting with, which again, at least to a layperson, seems reasonable. The larger question, for which I also don’t have an answer, is why the industry decided to pursue overlay systems, rather than developing stand-alone systems that would allow elimination of expensive wayside equipment. Perhaps the timeframe was judged to be too severe. Perhaps no one wanted to find out what the FRA meant when they said “demonstrated to [reliably execute PTC functions] to the FRA’s satisfaction” for stand-alone systems but only “reliably execute [PTC] functions” for vital overlay systems. The US railroad industry is also extremely conservative in the sense that it does not like changing its practices. We still have wayside signals on some lines nearly a century after the installation of cab signals made them obsolete. This was just as true of the privately run railroads, which maintained those redundant systems for decades before they went bankrupt, as of the successor agencies. This post really only scratches the surface of train control, but hopefully it provides an easy-to-read overview of the technologies that are out there today. Why signaling improvements have or have not been installed in certain locations, I cannot say, as that has much more to do with public policy decisions and internal agency politics than with engineering. This entry was posted in Uncategorized and tagged infrastructure basics, railroad signaling on May 17, 2015 by letsgola. There are still benefits of wayside signals even in areas with the conventional cab signal system you describe here. The cab signal system can only give you the status of the current block, while having wayside signals lets you “look ahead” some and thus optimize the train’s speed a bit more. Of course, you can also try to convey that information using some fancier method as some cab signal systems do, and a full CBTC system generally gives an equivalent amount of information. You can find all sorts of arguments about the finer points of all this on some railroad.net forums, if you’re really curious. It might be worth mentioning that Amtrak is using GE’s ITCS (Incremental Train Control System) on their Michigan Line where the Blue Water and Wolverine services operate. I’m not sure what the differences are between it and Wabtec’s ETMS, though. FWIW, ETCS Level 2 got fully operational on the SBB Neubaustrecke between Olten and Bern mid-2007 for maximum speed 160 km/h, and in December 2007 for maximum speed 200 km/h (the design speed of the line). About 250 trains per day use this line, freight and passenger, and there are groups of trains just 2 minutes apart. So, ETCS L2 could have been a choice. Of course, nobody could foresee that the signalling business unit of GE would become part of Alstom (one of the leading certified suppliers of ETCS systems). Interesting, b/c Alstom is also now the supplier for ACSES. If it is technically possible, one could expect the use of ETCS components, in this case. OTOH, brake curve supervision does not need communication-based systems; all you need is a system which allows to continuously communicate with the vehicle unit for the length of the supervised stretch of track (such as DB’s LZB (Linienzugbeeinflussung; linear train supervision; having been in use for several decades now, or SBB’s ZUB with loops, now replaced lineside with Euroloop. That is roughly how Alstom’s TVM-430 works on the LGV in France (used by all TGVs). Incidentally, there are several aspects that the ACSES overlay, designed by Alstom, not surprisingly shares with the techniques used in TVM-430. Unfortunately the historical PRR Coded Track Circuit does not allow for transmission of larger messages to the train. The only track to train messaging possible in ACSES therefore is via the Transponders, which is similar to their use for marking locations and feeding speed information in TVM-430. Any further communication has to be through the radio link in access since the so called Train – Voie communication in TVM-430 is not available via coded track circuit on the NEC. What a fantastic article. Thanks a lot.